Having learned Baseball/Softball, wrestling and squash made an IOC shortlist for potential inclusion in the 2020 Games, former Tokyo Yomiuri Giant great Sadaharu Oh, 73, who slugged 868 home runs and the first recipient of the National Honor Award, commented he is very much relieved. He stressed the need to combine forces of professionals and amateurs for the next 3 months with determination to bring the sports back to the Olympics. At the packed press conference including 6 TV stations in Tokyo on May 30 (photo), BFJ Vice President Yoshinobu Suzuki, former manager of Team Japan at the Seoul Olympics, expressed his hope to ask support of Hideki Matsui, 38 who retired as a player last season after having slugged a total of 507 homeruns in Japan and the U.S. He played for Tokyo Giants, the New York Yankees and three additional Major League teams and reached the 2,000 career hit milestone in 2007. Matsui also received National Honor Award at the same time as Nagashima. 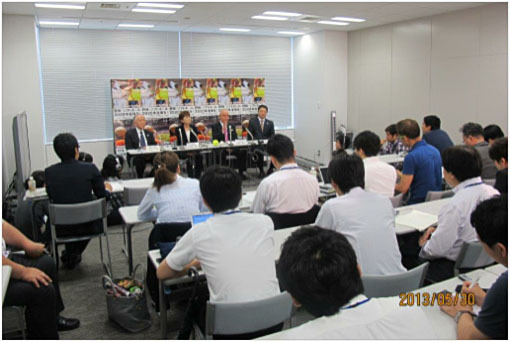 Ms. Taeko Utsugi, Vice President of International Softball Federation, supported Suzuki’s plan and appealed media corps to write and broadcast more about Women’s Softball games. Kazuhiro Tawa, senior adviser of BFJ and former First Vice President of IBAF, assured to the press that World Baseball Softball Confederation will continue to work hard to add values to Olympic Movement.